I am writing this while the launch of #SmartiPhone5 is currently ongoing at Resorts World Manila. 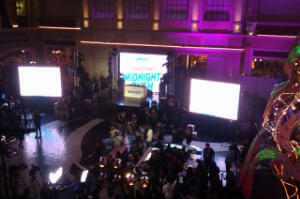 Everyone is waiting for the countdown ’til midnight as Smart announces the iPhone 5 in their latest offerings with plans for as low as P 999 that includes unli-data! Plans differ according to your needs and budget. With an iPhone Plan 2499, iPhone 5 will be available at Php 0 for the 16GB model, Php 0 for the 35GB model and P 6,000 for the 64GB model in all Smart Stores nationwide. 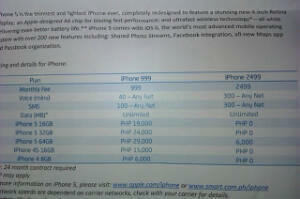 In addition, iPhone 4S and iPhone 4 will also be available for P0 with an iPhone plan 2499 beginning Dec 14. Smart will allow iPhone 5 customers to connect to its fast HSPA+ network. iPhone 5 is the thinnest and lightest phone yet by Apple. It is completely redesigned to feature a new 4-inch Retina display, an Apple-designed A6 chip for fast performance and ultrafast wireless technology – all while delivering even better battery life.